These are complete recent issues of Planet Waves Weekly, our e-mailed astrology magazine featuring Eric's horoscope. Publication of the weekly magazine began last September. 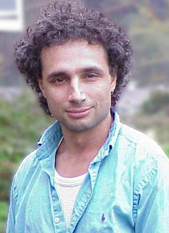 Eric's work has also appeared in the London Daily Mirror, The Mountain Astrologer, The Village Voice, Sierra Magazine, Loving More, Pan Gaia, America Online, Sexuality.org, StarIQ.com, and many other online and print outlets. Eric is a full-time astrologer and astrological writer living on Vashon Island near Seattle. <> If the text in the links below appears too small for comfort, please increase the text size under your browser's preferences. Thank you. If other issues are referenced but not posted, you may request a copy at no charge. The astrological perspective on why the loss of shuttle Columbia was such a critical turning point in world history. With weekly horoscopes and more. The astrology of the traditional holiday Candlemas, and the fascinating symbolism of Aquarius. With weekly horoscope and more. A reply to The Mountain Astrologer's "state of astrology" essay with an analysis of world events through the lens of the Centaur planets and asteroids. With horoscopes and more. Celebrating the abolition of capital punishment in Illinois, and looking at the astrology of former Governor George Ryan, the Pisces who freed death row. With horoscopes and more. Another response to The Mountain Astrologer's "state of astrology" essay, explaining how astrology can get itself a little more respect. With horoscopes and more.